Westbrook, ME – Evelyn Renna, 94, of Westbrook, passed away peacefully in her sleep at her home on Thursday, August 31, 2017. She was the wife of the late Joseph P. Renna. 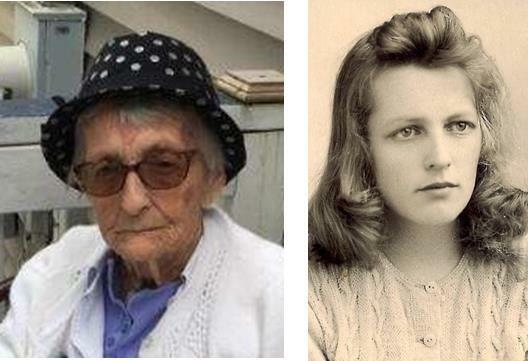 She was born in Vinalhaven, ME on April 11, 1923 a daughter of the late Freeman & Gladies (Bradstreet) Hopkins. She grew up in Vinalhaven, attending local area schools and graduating from Vinalhaven High School in 1941. While living in Vinalhaven she met her husband, a fisherman by the name of Joseph Paul Renna, of the coast of the island. Evelyn was a lifelong resident of Portland; she spent fifteen years at Health Tex and looked after many children throughout her life. Children were her greatest joy as she was constantly surrounded them, whether they were her own, her grandchildren or even neighborhood kids; she would treat them as her own and would do anything they needed. Evelyn is survived by three daughters, Tamara Coxe of Westbrook, Deborah Budroe and her husband Rob Grover of Windham and Rosalind Foster and her husband Gary of Westbrook. She also leaves nine grandchildren, fifteen great grandchildren and eight great great grandchildren. She also was the mother of the late Laurie Renna, who died in April 2017. Relatives and friends are invited to attend a graveside service on Friday, September 8, 2017 at 11 a.m. at Calvary Cemetery, 1460 Broadway, South Portland, ME.